Finkbuilt » Blog Archive » Trashballs! There is looking at life’s debris (see finkbuilt masthead), and then there is encapsulating it in one-inch diameter clear plastic balls and selling it in gumball machines. D.C. junkman/artist Christopher Goodwin does the latter with his wonderful Trashball! project. If you’re not in the D.C. area (currently the only city that has Trashball! machines) you can have them delivered right to your door for the unbelievably low price of $3.00 for a randomly selected 4-pack. Being the debris enthusiast that I am, I found it irresistable to give Trashballs! a try, and today my order arrived – a mere 3 days after I placed it. The actual capsules that the trash treats are packaged in are not your ordinary gumball machine bubbles. 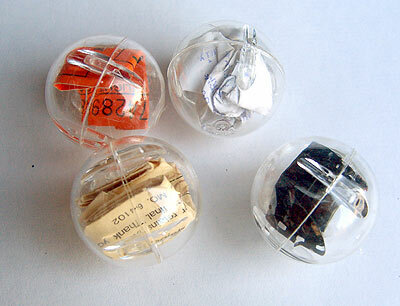 These clear polycabonate spheres are not meant to be easily opened. The only place that I have ever seen a case like these is at the core of of one of those light-up superballs. I actually had to destroy one ball to get it open. So what did I get? Trashball 1: Rather uninteresting register receipt for $2.09 worth of flooring materials from National Wholesale Liqudators. Trashball 2: Also sort of uninteresting bit of refuse, a baggage claim ticket. Trashball 4: Here is where it gets more interesting, at least for the visually oriented like myself, this one has the most story to tell. An unmounted frame of Ektachrome showing a woman in a nightgown helping a little kid in the late 1980′s or so, trying on his new prize-fighter gear that he presumably just received for his birthday or Christmas. At $3.00 for a 4-pack, I probably won’t be ordering more, but if there was a Trashball! machine at my local watering hole, I would deffinately be plunking quarters into that thing like a blue-hair at a slot machine. This entry was posted on Friday, May 4th, 2007 at 4:15 pm	and is filed under Debris, Reviews. You can follow any responses to this entry through the RSS 2.0 feed. Both comments and pings are currently closed. For what it’s worth, the baggage claim ticket holds some interest simply because it’s from a defunct airline (although I suppose those are a dime a dozen, for that matter). At any rate, thanks for featuring Trashball. Don’t get me wrong. I was not at all dissappointed to see either the receipt, or the baggage claim ticket, or trying to imply that they did not belong inside a trashball. I was just putting them in order as my “unballing” reached a crescendo with the discovery of the slide film. It looks like someone lit a ground bloom flower on the hardwood floor in that last pic. See the burns? ken- That’s actually emulsion damage from the film being wadded up inside the ball.